Ammonia production is one of the world’s fundamental industries. Ammonia plants are located wherever natural gas is abundant. The natural gas is a convenient source of hydrogen, and the nitrogen is always available from air. The two feed gasses for the Haber-Bosch process, hydrogen and nitrogen, are purified, heated, and compressed before flowing through a catalyst bed in the reactor. Since the reaction does not completely convert the feed gasses into ammonia in one pass, the ammonia is removed and the nitrogen and hydrogen are recycled back into the reactor. 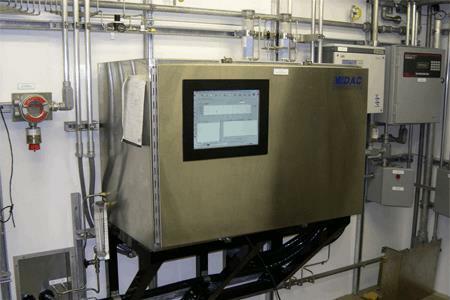 The monitoring for water is required because there are many possible sources of water contamination and even as little as 10 ppm can ruin the expensive catalyst bed. The monitor must be reliable since the survival of the catalyst depends on it.